[PDF] Cross-Cultural Marketing: Theory, practice and relevance | Free eBooks Download - EBOOKEE! Description: Cross-cultural marketing is an important element of the contemporary business environment. Many conventional accounts of the topic have conflated cross-cultural and cross-national marketing, but in this groundbreaking, new book, Burton argues that these generalizations have little meaning given the extent of multi-culturalism in many societies. Given the importance of new emerging markets in the Far East, Middle East, Asia and Latin America, this book raises important questions about the applicability of existing marketing theory and practice, which was originally developed using the model of Western society. An extensive range of cross-cultural marketing issues is addressed, including: Cross-cultural consumer behaviour Cross-cultural management practice Promotional strategies Product development Distribution Marketing research methods Cross-cultural Marketing offers a new, more complex and sophisticated approach to the important challenges for existing marketing theory and practice and their continued relevance for stakeholders. As such, it is an invaluable text for students of international and cross-cultural marketing, as well as for practitioners who wish to assess new developments in the field. 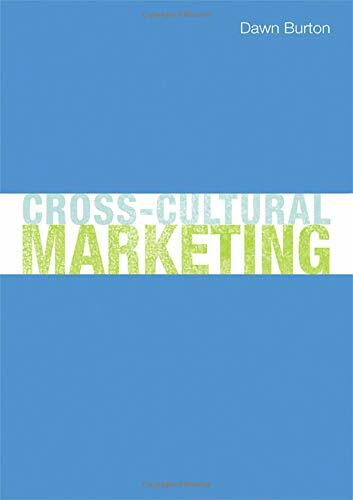 No comments for "[PDF] Cross-Cultural Marketing: Theory, practice and relevance".